Launch a campaign to strike back against the evils plaguing Varisia with the Pathfinder Adventure Card Game: Rise of the Runelords Base Set. This complete cooperative strategy card game pits 1 to 4 heroes against the traps, monsters, deadly magic, and despicable foes of the Pathfinder roleplaying Game's award-winning Rise of the Runelords Adventure Path. Choose your character's class; build a deck of allies, equipment, and magic; and explore lethal locations as you journey through multiple scenarios in an exciting fantasy adventure. 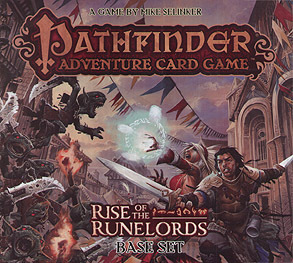 Characters grow stronger after each game, adding unique gear and awesome magic to their decks, and gaining incredible powers, all of which they'll need to challenge greater threats in a complete Pathfinder Adventure Card Game Adventure Path. Supplement your Rise of the Runelords experience with the Character Add-On Deck and bimonthly Adventure Decks.